To celebrate our pre-wedding anniversary (1 year until the Big Day!) my fiancée and I treated ourselves to a magnificent fine dining experience at Chef Charlie Palmer’s Michelin-starred Aureole in Times Square. 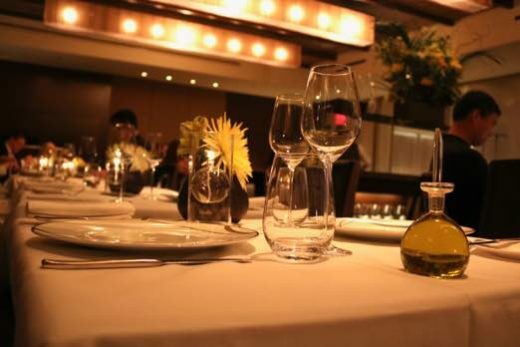 After being a New Yorker for nearly eight years now, I am usually hesitant to dine in the center of the tourist district, but I found Aureole to be an exception and more than worth it. The restaurant is featuring a new seasonal menu that it will leave your tastebuds and eyes singing in delight. With the talents of Executive Chef Gabriele Carpentieri and Executive Pastry Chef Renaud Besnard, culinary magic is being made in Times Square, of all places! From the outside, Aureole seems to be an oasis for businesspeople looking for an after-work bite. 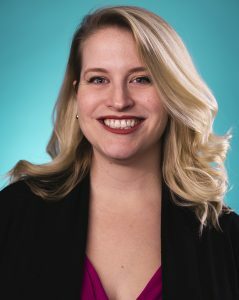 But there is a less casual, back room reserved for special occasions and 5-star service—and that’s exactly what you get. The level of service was impeccable—some of the best I’ve had in the city. To give you a sense of what I mean, every time we got up from the table, someone was quick to hold the tablecloth back so we could easily get in and out. From the maître d’ who greeted us, to the terrific sommelier who knew exactly what kind of wine I was hoping for, and the waitress and runners who were knowledgeable and warm without being overbearing. 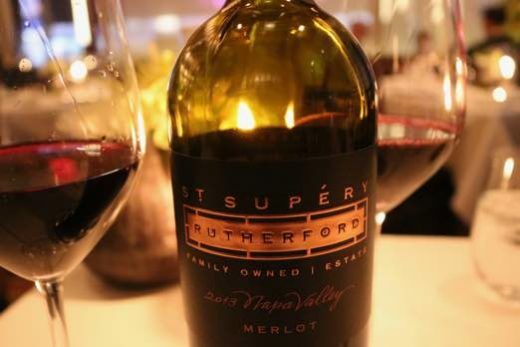 After a fine glass of Champagne, the sommelier recommended St. Supery’s Rutherford 2013 Merlot from Napa. It was absolutely lovely–velvety, medium-bodied and round, with notes of dark red berries and a little mocha. It’s a great stand alone wine, while being soft enough to drink with your meal too. My partner and I split three appetizers, which was the perfect amount for sharing. 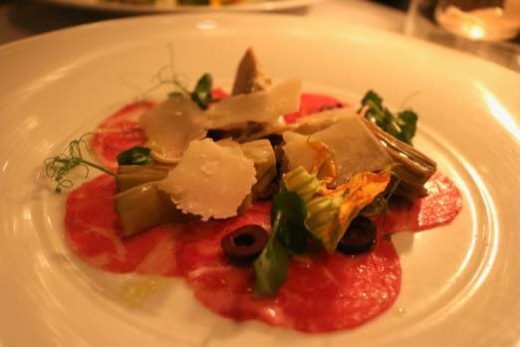 We first tried the Wagyu Beef Carpaccio, served slightly chilled with artichokes, hard shaved parmesan, squash blossom, and taggiasco olives. The beef was cut nice and thin and drizzled with a touch of olive oil and topped with microgreens. I definitely recommend it for carpaccio fans; plus, wagyu is one of the highest quality red meats you can order. 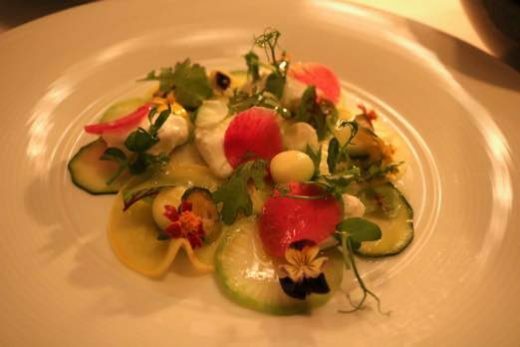 For vegetarians who want to partake in ordering carpaccio sans the meat, the Zucchini Carpaccio with truffled burrata, microgreen and delicate edible flowers was equal parts creative and delicious. The fresh ingredients, aroma of truffle oil (I didn’t think burrata could be more tasty, cue the truffle oil!) and pretty purple and yellow flowers seem just right for a healthy appetizer on a hot summer’s day. I most admire their unique combinations of seasonal ingredients, which they arrange in surprising ways. 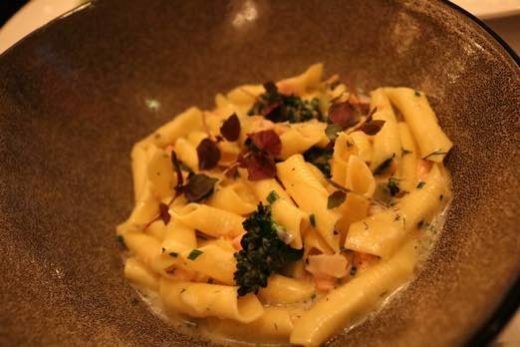 For instance, the third appetizer we tasted was the homemade Garganelli pasta with poached salmon, charred broccolini, fennel and dill in a subtly light white sauce. The herbaceous dill and fennel are the star flavors of this dish; and what a divine pairing to go with salmon, which was flaked into small pieces and mixed into the pasta. It almost went into the territory of comfort food, but the light ingredients kept it airy. My favorite savory dish of the evening, aside from the Garganelli pasta, was one of our chosen entrees, the Moulard Duck Breast. Cooked medium rare with a thin layer of flavorful fat on the outside and a slight crisp on the edges, the duck was pleasingly tender—almost could have used a butter knife! Served with cooked sweet apricot, chanterelle mushrooms and candied shallots in an emulsified apricot sauce, this dish was another creative use of seasonal produce and different textures. 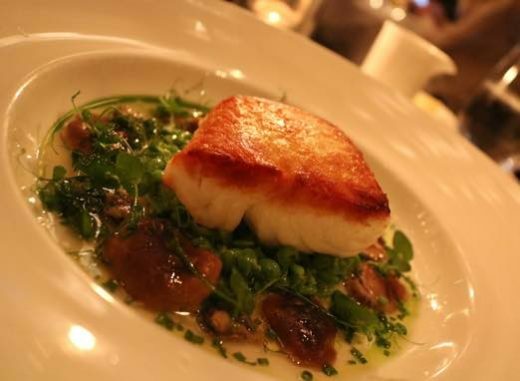 For seafood lovers, the Nova Scotia Halibut with minted peas, clams and shiitake mushrooms could be the choice for you. The meaty and hearty white fish is fairly mild in flavor, so the minted peas are the primary punch of flavor. The fun in this dish lies in the pouring of the fumet broth (mainly made of fish stock), which is done tableside. Our waitress even left the remainder of the broth to dip our bread in—much appreciated. 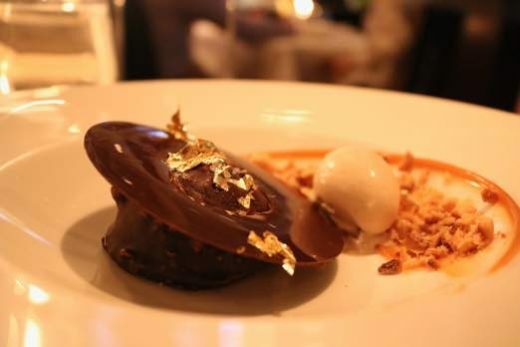 Their philosophy of simple, fresh, seasonal food carries over to their dessert menu as well. 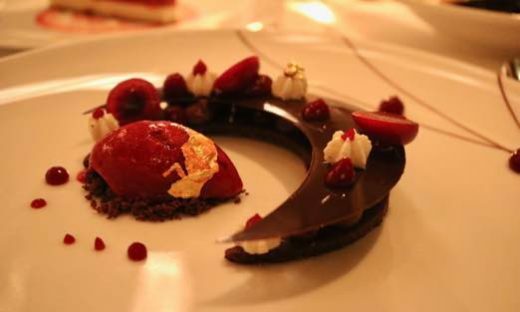 Each dessert we tried was truly aesthetically beautiful—two of them had edible gold leafing, which was a lovely touch. I almost didn’t want to destroy them with my spoon! My pick for the top dessert was the Black Forest cake. It’s not your typical black forest cake; it’s deconstructed to its individual parts with a chocolate sable crunchy cookie bottom, earl grey cremeux in the middle and a thin layer of decadent chocolate crisp on the top, accompanied with housemade cherry sorbet for brightness. The Hazelnut was also terrific. Composed of a rich manjari dark chocolate mousse, housemade pralines for crunch, and creamy hazelnut gelato, also made in house. 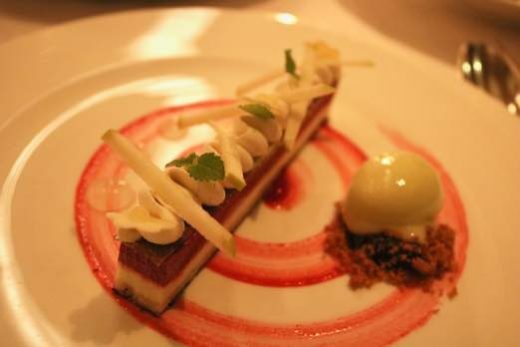 My partner’s top choice was a gourmet spin on apple pie, the Apple-cassis Semifreddo. Layered semi-frozen cake with a layer of macaron, and basil tuile with a green apple sorbet came together for an overall tart and refreshing treat. 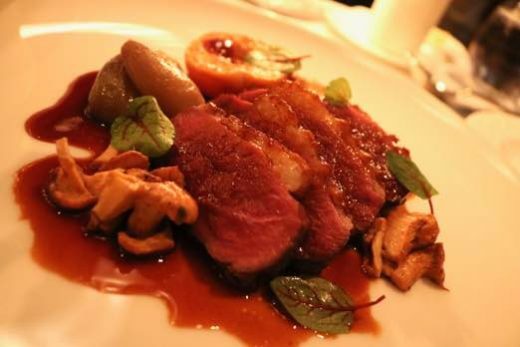 Aureole earned 10 out of 10 stars in my book. It would be the perfect place for a special occasion or if you are looking to treat yourself with an inspired meal, full of whimsy, artistry and fresh ingredients. I am looking forward to visiting again in the Fall/Winter seasons. 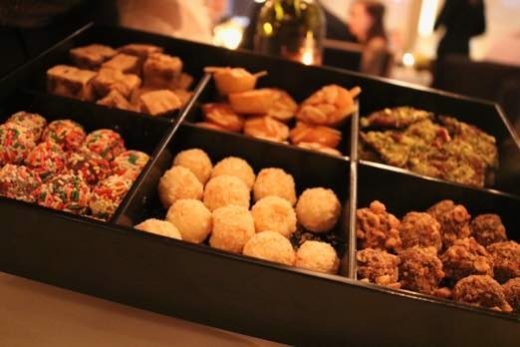 The assorted petit fours they offered on our way out are another testament to the special dining experience Aureole offers.